In today's world with everyone striving to make leading edge products as cheaply as possible, Pro-Action has taken a different approach to curing the problems with the forks on the Harley-Davidson touring bikes. The forks on a street bike have no reason to have to be a high dollar cartridge system. There is nothing wrong with a long time proven damper rod system that was, and still is the standard of the industry. So with Harley there is nothing wrong with the damper rod system. The theory is solid. The malfunction lies within the manufacturers design. 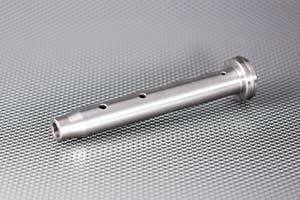 We have designed and machined new damper rods out of billet steel. 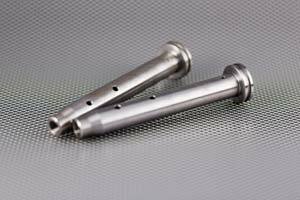 The new rods have completely different flow characteristics than the standard rods. 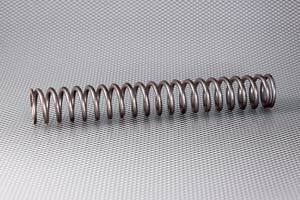 We have replaced the stock spring rates with springs in may cases nearly twice the standard rate. The oil level and weight of oil have been modified to accommodate the new flow characteristics. The finished product is a fork that doesn't sag, greatly resists bottoming, rips high speed turns with confidence, but yet in all areas there is a much softer and smoother feel than stock. Low speed, mid range, and high speed bump reaction is nothing short of amazing. We have created a system where the damper rods, springs, spring pre-load, oil level, and oil weight have come together to provide a front end that does it all for just $295.00. Fits most 41m and 49mm forks on Harley-Davidson Touring bikes from 2006 to 2018. Kit includes Damper rods, Heavy springs, and spring spacers. The kits will fit other HD applications as well. Call for information and fitment on your bike (724) 846-9055. Copyright © Pro-Action. All Rights Reserved. Site by ABS Development Co.